Shaping up while deployed isn’t easy, but with a little creativity and a do-it-anywhere program, it’s far from impossible. Get shredded, even while you’re touring overseas. I hate to be the one to break it to you, but you're probably not going to get huge if your lifestyle includes sleeping in a different location every day. 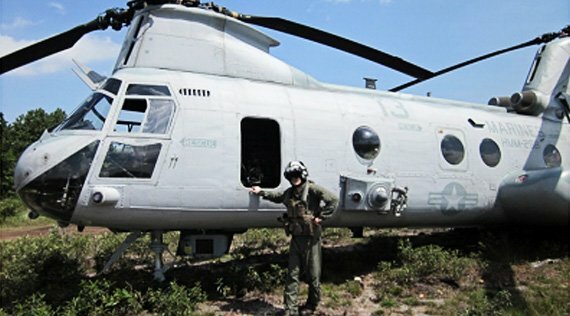 The best you can reasonably hope for is maintaining what you have and bulking when you get a chance back at the FOB (Forward Operating Base). So, where's the gym around here? What, there isn't one? What do I do now?! Make your own gym! You have to make adjustments to your training routine, but creativity can save you. Slow-tempo and plyometric bodyweight exercises may not be ideal for bulking, but can still offer enough stimulus to prevent catabolism for a few weeks. When you're looking for something heavier or for different movements, there's no requirement that you must lift only a dumbbell or barbell. If you have a vehicle or aircraft nearby, many have handholds, stowage bars, or horizontal surfaces you can grab. Use these for pull-ups (or partials) and bodyweight rows. If you're lucky enough to have a set of rings, a body suspension system or cargo straps, you can add bodyweight biceps curls, triceps extensions, bodyweight flyes and dips. Resistance bands are a great investment! They're small, portable and accommodate an array of exercises to keep your sinew occupied. A full 5-gallon water jug weighs approximately 45 pounds and has a convenient handle at the top. Too heavy? Drink a few gallons! Ammo cans full of sand weigh about 30 pounds. Use these for lateral raises, bent-over rows, biceps curls, overhead extensions, or for just about any exercise a kettlebell works for. Boulders, logs and sandbags come in just about any weight you can imagine, both standard and metric. Biceps curls and overhead military presses are some obvious exercise choices, but don't limit yourself. Example: Try a quasi-power clean into a boulder throw: Find a rock (or similar object), heave it up to your chest as you would a power clean, and use your legs and shoulders to throw it as high and far as possible. You can also bear hug it across your chest and do front squats or lunges. Machine gun barrels and tent poles with sandbags hanging on the ends can be treated as light barbells. Since they're not perfectly balanced, they may be better-suited for squats and lunges. Don't forget about basic core exercises! Crunches and planks are a good start, but consider adding functional fitness moves with items previously discussed. When you have no conventional workout equipment whatsoever, you must be creative! Customize these training ideas as your duties allow. You may train one body part per day, five times per week; or 3 times per week, two body parts per day. In the field, doing the work is far more important than the split. A pull-up bar is great, but not required. Any overhead object that supports your bodyweight can be used, and may provide unusual hand positions. Any object between knee and shoulder height that supports half your bodyweight can be used (vehicle undercarriage, table) and may provide unusual hand positions. Hang under the object with your feet firmly on the ground and row your body up. Pause for full contraction at the top of each rep.
Bend at the waist and grab a water jug with one hand. Keep a negative arch in your back, bring your elbow back above your ribs. Pause for full contraction at the top of each rep.
Take a few sips of water between sets to stay hydrated and slowly decrease the weight. With a medical litter on the ground, put enough weight on one end so you can use the handles on the opposite end as push-up handles without the fulcrum effect. Pause at the bottom of each rep for maximum stretch throughout your pectorals. For added benefit, elevate your feet. Lay on the ground, a cot or a litter, take two equally-filled sandbags (one in each hand) and slowly lift them from the flye position to nearly overhead. Swap sandbags between hands each set, as there will most likely be a small difference in weight. Loop the midpoint of a cargo strap around an overhead object that will support half your bodyweight (tree branch, vehicle rail, etc). Face away from the support, grab one end in each hand, and with your feet firmly planted, lean forward until your hands are pulled back into the fly position. Without moving your feet, bring your hands together in front of your chest and slowly lower yourself back down. Holding a boulder with both hands, press it vertically from your chest to overhead with full extension. Do not press it directly over your head; boulders easily slip! Ensure you wear boots in case you drop it on your toes. Fill two empty ammo cans with sand to reach a desired weight. Close/lock the lid, grasp the handles, and raise them out to your sides. Keep your pinky finger higher than your thumb to ensure proper activation of the medial deltoid head. Thread a cargo strap through a hole in an object you can lift (water jug handle, ammo can handle, etc). With each hand, grab the strap 1-2 feet away from the weighted portion. Standing upright, bring your elbows above shoulder level as you rotate your hands inward so your knuckles face each other. Pause at the top for full shoulder contraction, then slowly lower. You'll need two buddies and a medical litter. Have one buddy lie on the stretcher, while the other two pick it up by the handles. In a synchronized fashion, the two lifters simultaneously shrug the "weight," holding for a second at the top, and lowering. Cadence is key on this, and the "victim" on the stretcher may call out the count. Fill an empty ammo can with sand to reach a desired weight. Close/lock the lid, grasp the handle and curl it toward your shoulder. Pause at the top for full contraction and slowly lower. Place your hands on a chest-high object (wall, tree, vehicle, etc.) as if you were doing a standing push-up. Lower your hands about a foot, move them closer together, and move your feet back so your body is angled against the "wall." Keep your elbows pointing forward, lower your body by bending your arms at the elbows until your forehead nearly touches your hands. Use your triceps to push your body back outward. Hoist a machine gun (or similar object) over your shoulders and hold it like a barbell you're about to squat. Step one foot out at a 45-degree angle and allow your rear knee to drop nearly to the ground. Push off your front foot to return to the standing position and repeat with your other leg. Grab a log with a bear hug (for front squat) or behind the head (for traditional squat) and slowly lower your body until your thighs are parallel to the deck. Push back up to the standing position. Ensure nobody is close enough to be injured by the weight when you drop it! MREs! Whoo hoo! The bad news is that you'll probably consume highly processed foods instead of lean meats and fresh vegetables. To make matters worse, you'll have little control over what you're able to eat. The good news is that you have a lot of control over when you eat it. 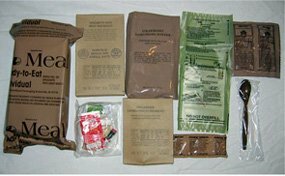 In case you never checked, the average MRE contains around 1200 total calories - 50 percent carbohydrates, 35 percent fat, and 15 percent protein. That comes out to roughly 20 grams of protein per MRE. Given this, I don't advise consuming your daily 1-2 grams of protein per pound of bodyweight by consuming 10 complete MREs. In fact, you probably won't be able to get more than 100 grams per day. The average military male will get by with roughly two MREs per day. Adjust your consumption by size, activity level, and supply allotment. If you receive mail, or can stock up back at base, supplements can make a huge impact on your goals. There are a lot of nutrient-dense, convenient, delicious options that will make hitting your goals much easier. Meal replacement powders, single-serving protein packets, protein gel shots, and protein bars are incredibly useful tools. Like most military dining experiences, every MRE comes with a dessert. As far as I know, eating the dessert is not mandatory. In fact, you can often get a good trade with another guy, so you can enjoy some peanut butter or "cranberries, osmotic" instead of your "pan-coated disks." I recommend holding onto the dairy shake if you get one; it has a similar composition to some commercial mass-gaining shakes. Also, try not to eat the whole MRE in a single sitting. Spread it throughout the day and drink/eat the beverage powder near workout time. Remember, chow is continuous! Here's a sample daily meal plan using three full MRE's per day (about 3,600 calories). I generically label each MRE as A, B or C, so as you mix and match components of each at different meals, you can keep track of what's what.